Chevrolet’s Corvette took off in a completely new styling direction for the 1963 season. Based on the experimental Mitchell Sting Ray Racer that had been on the race circuit since 1957, the new Corvette was more angular in looks than its predecessors. A 1:4 scale model of the new sports car was tested in wind tunnel experiments. 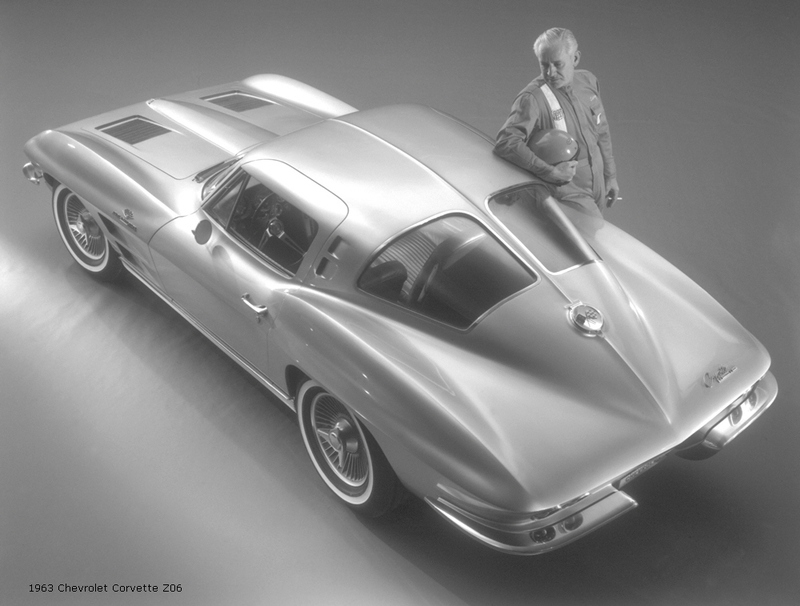 Results from those tests dictated the final shape that Corvette would take. Side glass with compound curves was the latest styling trend in Detroit that year. If Rambler was having curved glass, so was Corvette. 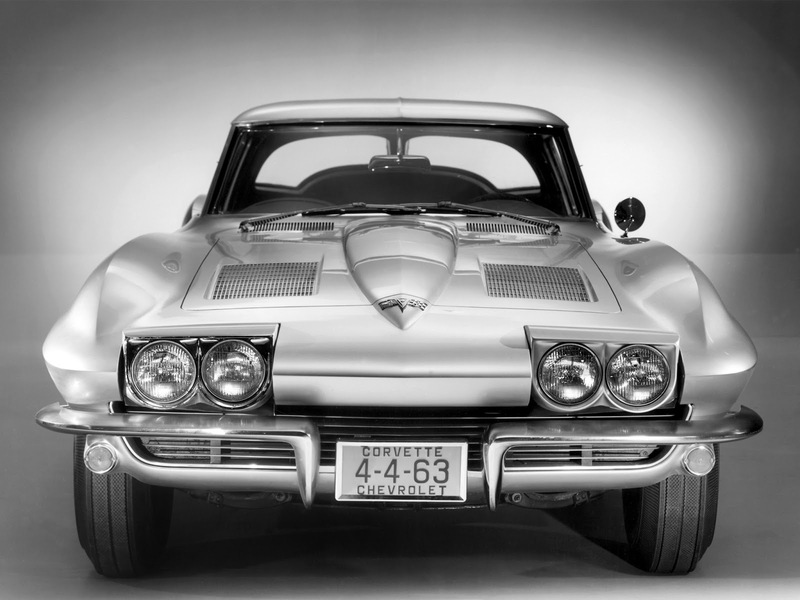 With the help of tiny motors, Corvette’s headlights rotated out of sight when not in use. The pod-headlight styling trick was superb and even added to the car’s aerodynamics. Hidden headlamps also gave a sleek, uninterrupted front profile. The hood sported twin full-length depressions that carried large, simulated air-intake plates. The grille, made up of thin, horizontal aluminum bars, was deeply recessed into the lower half of the front. Bumpers were understated spaghetti straps in chrome. 1957 Q Corvette clay model. 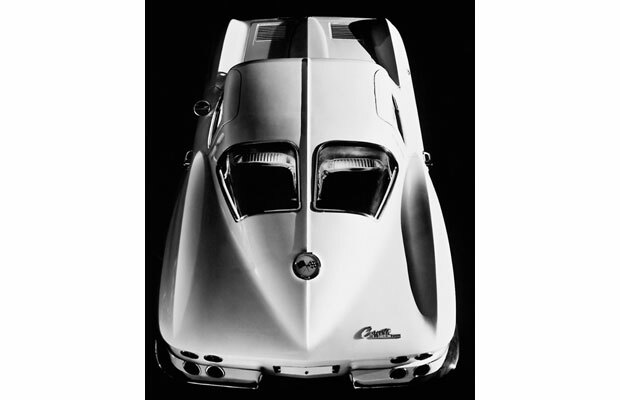 Lines flowed effortlessly in Corvette’s profile. Two deep indentations moulded into the trailing edge of the front wheelwell spoke of speed, even when the sports car was sitting still. 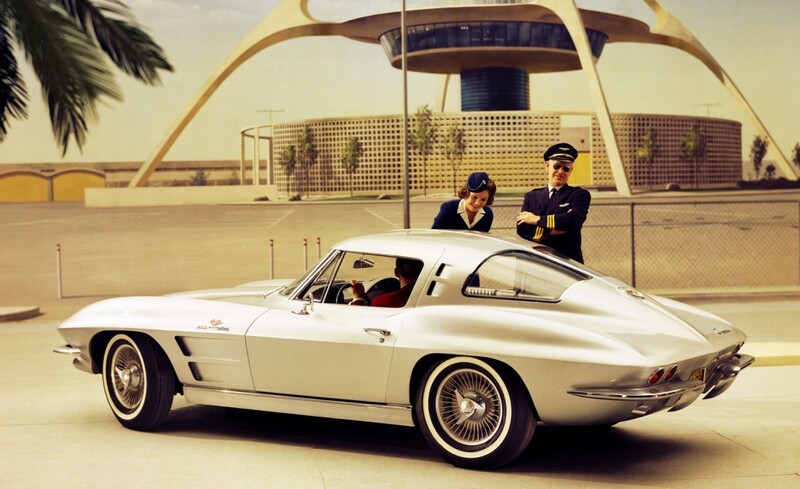 Corvette was one of the first American automobiles to acquire the Coke-bottle swell in its rear quarter panels. It was the perfect look. 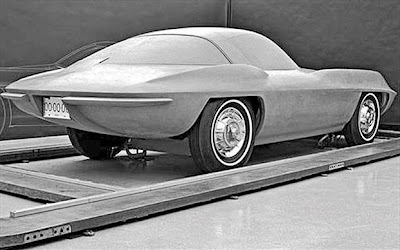 A raised spine or dorsal fin that ran the length of the coupe gave the perfect excuse for designing a split rear window, which was Bill Mitchell’s brainchild. The gas filler cap was centrally located in the rear, below the window. A pair of bumperettes was given the task of silhouetting two small, round taillights. A Corvette2+2 was developed in styling alongside the two-seater but it required an extra ten inches of length to accommodate the rear passengers. Altered rear fenders and a higher roofline changed proportions sufficiently that the larger model never saw the light of day. 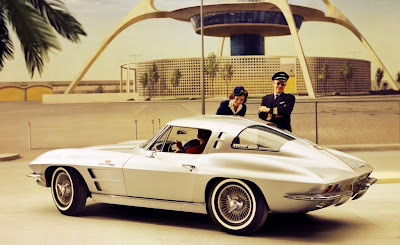 Advertising claimed that streamlining was the goal and indeed designer Zora Arkus-Duntov--working under the watchful eye of GM styling guru Billy Mitchell--created a classically elegant and graceful fastback coupe and convertible. The latter could be ordered with a hard or soft top. 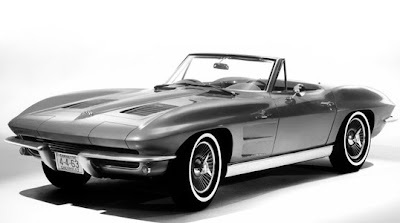 Basic design for the ’63 models was locked up by September of 1960, although studio photos show that the hardtop roof for the convertible came into being in February of 1961. The wheelbase was cut ten centimetres (four inches) to 249 centimetres (98 inches) and the overall length was shortened by five centimetres (two inches) from the 1962 model. 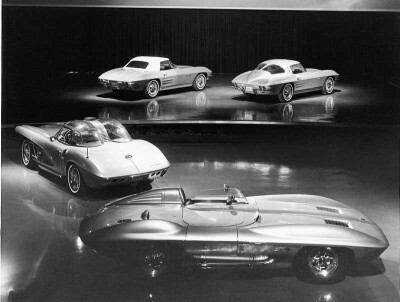 Chassis, frame and the rear axle were all new to Corvette. So was the rear suspension, which was given a three-link independent system at each wheel. A multi-leaf transverse spring was bolted to the differential carrier and extended from one rear wheel to the other. This set up handled vertical loads. Radius arms, axles and control rods, running from the differential to the frame, handled horizontal forces. More of Corvette’s weight sat on the back wheels than the front. Engines were carried over from 1962. The 5-3-litre (327-cubic inch) V-8 was standard with its 250 horsepower rating. 300 horses cost $54 more, 340 horses cost $108 extra and the fuel-injected 360 horsepower version added a whopping $340 to the tab. For a short while the higher horsepower engines came with a buzzer that sounded at 6500 RPM. The intention was to alert the driver that he was “…approaching excessive engine speeds.” The buzzer was dropped because no one could hear it over the engine’s roar. A three-speed manual transmission was standard but a close-ratio four-speed could be had for $188 or, for $199.10 Chevrolet’s Powerglide automatic could be installed. 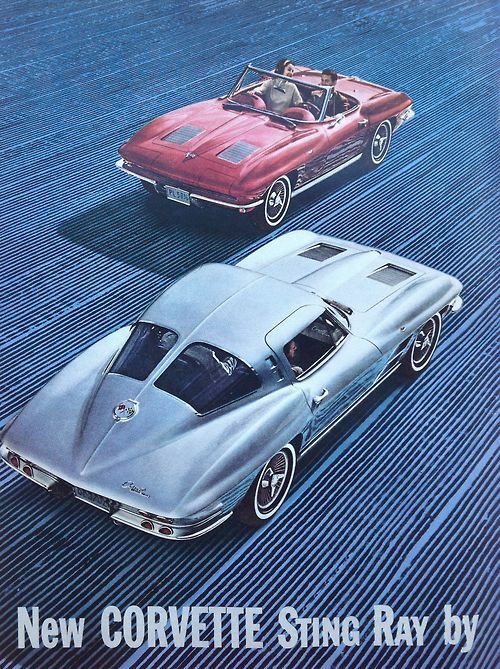 For the first time, power steering, power brakes and air conditioning were available in Corvettes, though archives show that only 280 buyers purchased the cool option at an equally cool $421. Leather seats were a choice for the first time, if one had an extra $80 in his pocket. For $202, purists could order the optional 136-litre (36- US gallon) gas tank on coupes. Corvette was kept ultra-secret and when it was finally shown to the public, the motoring public went wild over the sensational vehicle. Chevrolet had an imediate hit and an instant classic on its hands. 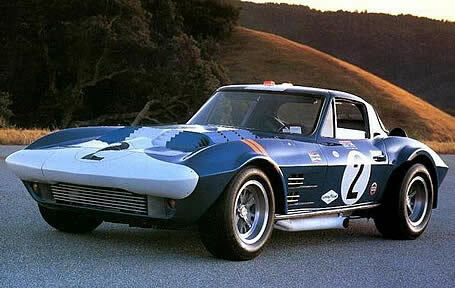 Chief Zora Arkus-Duntov even built five Grand Sport specials to Challenge Carrol Shelby’s Cobras on the track. In its initial year 10,594 coupes were built and 10,919 convertibles in Chevrolet’s St. Louis, Missouri plant, a full third more than the previous year.